An Omnipod PDM and USB Mini-B or Mini-AB cable - Mini-A USB cables have white plastic in the end, and are not meant for peripheral devices, so they will not work with your PDM. Mini-B cables are far more common and one would have come with your device. 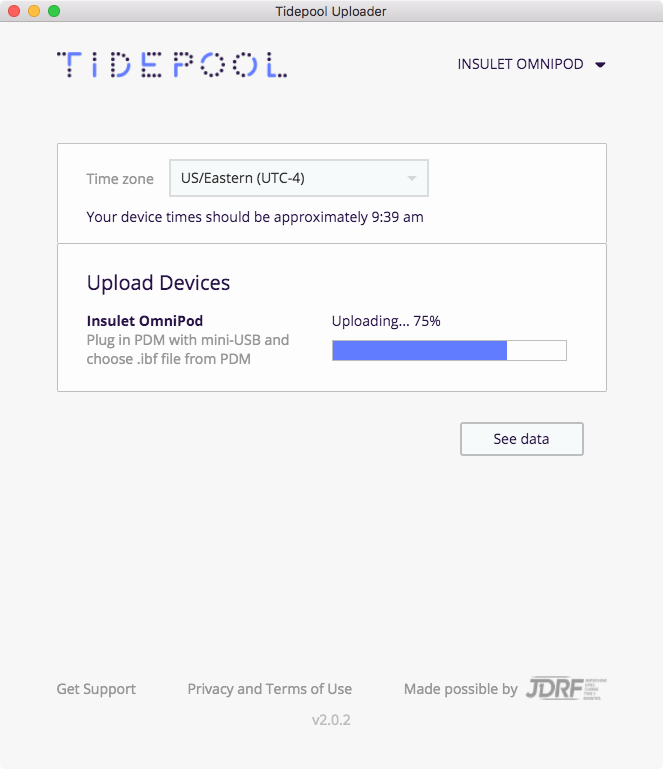 If you would like to be notified when we add support for Omnipod DASH, please send an email to support@tidepool.org. 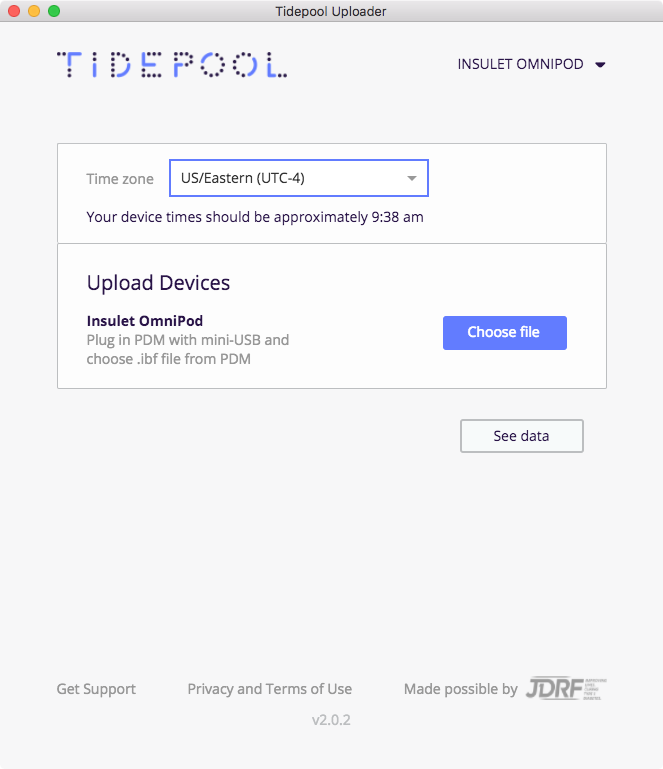 Connect Your Omnipod PDM to your computer. Wait for the PDM to read “USB device ready” at the top of the screen before proceeding. 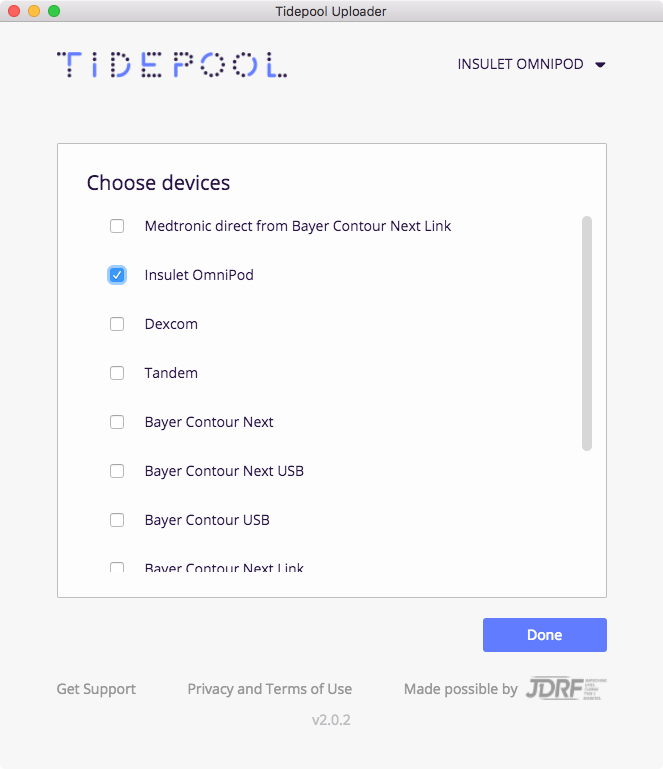 Confirm "Insulet Omnipod" is one of your Devices. You can change your devices by selecting "Choose Devices" from the menu under your name. Select "Choose File" in the Tidepool Uploader to open a window to select your .ibf file. A window will appear allowing you to select the .ibf file from the Omnipod PDM. On a Mac, you will see the Omnipod PDM as a drive called "NO NAME." On Windows, you will see the Omnipod PDM as a "Removable Disk" drive. Select the .ibf file within the drive and then click “Open”. Your data will begin to upload automatically after your .ibf file is selected. Leaving the Uploader selected on your computer (in front of other windows) will allow it to execute the upload more quickly. It is common for users to save their .ibf files in a folder just in case they would like to access them again later. You can drag the .ibf file directly off of the device onto your desktop or a folder of your choosing to save it. If you connect your PDM and do not hear a beep, nor does it read “USB Device Ready” on the screen - you may need to try a different USB cable. Many Mini USB cables are power only and do not have the circuitry for a data connection. If you have a cable that you know carries data, please try another USB port on your computer.